Despite differences in opinion on a host of individual issues, China and the United States are going ahead with various meetings as the two countries work to emphasize the importance of maintaining stability in the overall Sino-American relationship. The first set of meetings, due to start Wednesday in Beijing, focuses on human rights, followed by high level strategic and economic talks in Washington next month. Chinese Foreign Ministry spokesman Hong Lei listed some of the topics the Chinese side expects to discuss in two days of human-rights meetings with US officials. He says they will discuss new progress in human rights in both countries and human rights cooperation in the United Nations. 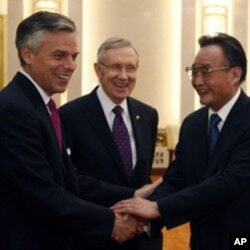 But he said China is against any country using human rights as an excuse to interfere in China’s internal affairs. He acknowledges there are differences between China and the United States on human rights. But he said the two countries can increase mutual understanding through dialogue, on the basis of equality and mutual respect. In a brief statement issued last week, the Department of State said the discussions will focus on human rights developments, including the recent negative trend of forced disappearances, extralegal detentions, and arrests and convictions in China. It added that other U.S. concerns include rule of law, freedom of expression, religious freedom, labor rights and minority rights. Chinese authorities have netted dozens of human rights activists and lawyers in a crackdown on dissent that began after Internet postings urged Chinese people to hold protests similar to the Jasmine Revolution demonstrations that brought down governments in the Middle East. There have been few signs of actual protest, but the Chinese government has reacted harshly. Meanwhile, Chinese authorities also have cracked down on worshippers at an unregistered evangelical church in Beijing and prevented them in recent weeks from holding meetings outdoors. Congregation members say hundreds of people have been put under house arrest. U.S. Ambassador Jon Huntsman, who is due to leave China at the end of this month, recently gave a farewell address in which he emphasized the importance of communication on contentious issues like human rights. "Where we have differences, we owe it to ourselves and to future generations to speak respectfully, but also candidly and honestly," he said. "And the best way to do this is to maintain a consistent dialogue at all levels throughout the highs and lows in our relationship." The United States has been among the countries calling for China to free detained dissidents, including well-known artist Ai Weiwei. Meanwhile, Secretary of State Hillary Clinton and Treasury Secretary Timothy Geithner host their Chinese counterparts for several days of high-level strategic and economic talks next month in Washington.